If you have a small garden pond with a filter and pump, a mesh bag over they intake will keep leaves, worms, and minnows out of the filter. If you have to clean decorative rocks or gravel, a mesh bag can allow you to spray a hose at the rocks without scattering them. 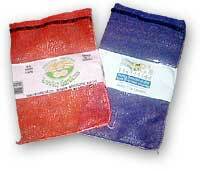 Fill a mesh bag with cotton rags and use as a scouring pad for a boat hull, RV, wood deck, or house exterior. Apparently birds get their feet caught in the modern mesh bags. Make a cube out of hardware cloth (wide-mesh heavy gauge screen) instead. Some objects that need to be clamped together for gluing cannot stand the stress of a regular clamp. You can combine a mesh bag with something like a plastic bread bag, garbage bag, or folded over piece of plastic sheeting, depending on the size, shape and strength of the objects, to make a clamp to glue them together. Depending on the pump you have, you may either seal the bag or let it continue to try evacuating the bag. Since atmospheric air pressure is about 14 lb/in2, removing air from inside the bag puts a very strong force uniformly all around the items to be glued, while also helping extrude the glue in a uniform way (for the right kinds of glue). Professionals use specially designed pumps which can maintain a given vacuum pressure, but a DIY alternative is to use a food preservation vacuum sealer.